Staying on top of all the current trends in the fast-paced social media world can be a daunting task. When it comes to social media marketing for a business, there are many parameters and guidelines that must be continually monitored for changes as they evolve very quickly. One of the most important and challenging of these are the dimensions of social media graphics. You don’t want to be that brand on social media who isn’t taken seriously because you show that you don’t really know how to use the platforms you’re on. Studies show that content posted on Facebook that has corresponding images or infographics, has an 87% interaction rate from fans. Not only is it important to include an image or video with your social media posts, but it’s crucial to also stay on top of the correct size for each social media platform. If you’re sizing images incorrectly, your followers may not be fully engaged with the visuals you’ve taken the time to create. It’s also important to stay up-to-date on the correct dimensions when it comes to the profile photos on your social media accounts. This article will guide you through the most up-to-date information when it comes to social media image sizes, profile image dimensions, and any other graphic sizes that’re important for social media. We’ll explore the top social media sites that require graphics including Facebook, Twitter, Google+, Instagram, and LinkedIn. Facebook is the leading social media platform with over 2.07 billion monthly active users as of November 2017. Most say that they’ve led the way when it comes to how people have engrained social media into their lives. To give Facebook users the best experience possible when interacting with your brand’s page, designing images to these specs will be important. Your profile photo on Facebook is the image that not only represents the essence of your brand, but is also the image that users see alongside your posts and photos in their Facebook news feed. Some make the mistake of changing their brand’s profile photo to something generic and/or not brand recognizable. You don’t want to make this mistake as a brand, as it can hurt engagement when people see your posts, ads, photos, and videos in their news feeds. The profile photo or image will display as 170 × 170 pixels on computers, and 128 x 128 pixels on smartphones. Keep in mind, the image you upload will automatically be cropped to fit into a circle shape next to your name when you’re active around Facebook. It’s recommended that a PNG file is uploaded if an image of a logo or text is used, but Facebook will also accept JPG. In September 2015, Facebook released an option for their Facebook Profile Photo that appears for users in the mobile app. You can now take a short video through the mobile app and use that as your profile video. This feature stemmed from the Harry Potter movie, and is now available in real life. Please note that this feature is not currently available for business pages. The cover photo is also an important piece for your brand and should be used to represent it with items such as your top product or menu item. In the past, the profile photo displayed on top of the left corner of the cover photo, but now the profile photo and cover photo have their own spots on the page. The image that’s uploaded for the cover photo must be at least 399 x 150 pixels. For best quality, if there’s a logo or text, Facebook recommends uploading a PNG file, but will also accept JPG. Cover Photos should only have a max file size of 100KB. New as of summer 2017, Facebook now allows cover videos as a supplement to cover photos on business pages. These videos should be at least 820 x 312 pixels and between 20 and 90 seconds. Facebook recommends a video that’s 820 x 456 pixels for best results. Once uploaded and posted, the video will continuously loop as users browse your Facebook page. Cover videos can also have audio, but they’re defaulted to play in mute. If you create a Facebook event, your event cover photo is the header image, or video, that’s displayed at the top of your event page. If using an image, it should be 1920 x 1080 pixels, and videos should have the same 16:9 ratio. Square Image: Square images on Facebook should be 900 x 900 pixels. Portrait Oriented Image: If you post an image with portrait orientation to Facebook, the recommended size is 476 x 714 pixels. Landscape Oriented Image: If you upload an image with landscape orientation, it should be 1200 x 900 pixels. When you share a link, Facebook will automatically pull images from the website to display, but you oftentimes have the option to upload your own image. Additionally, you have the option to choose just one image, which will display at 470 x 246 pixels, or multiple images for a carousel, which will each display at 300 x 300 pixels. Twitter has the option to upload a header photo along with a profile photo. Along with these two image options, you can also click on “Edit profile” to customize your theme color. The theme color is the color of the hashtags, handles, and hyperlinks you’ll see on the desktop version of Twitter. Your profile photo on Twitter should be treated like your profile photo on Facebook. This should be used to represent your brand in the best way possible with a logo. This profile photo will not only be on your profile home page, but will show up in a user’s news feed when you post a tweet, photo, or video. Make sure your logo isn’t cut off when it’s cropped in the circle shape. 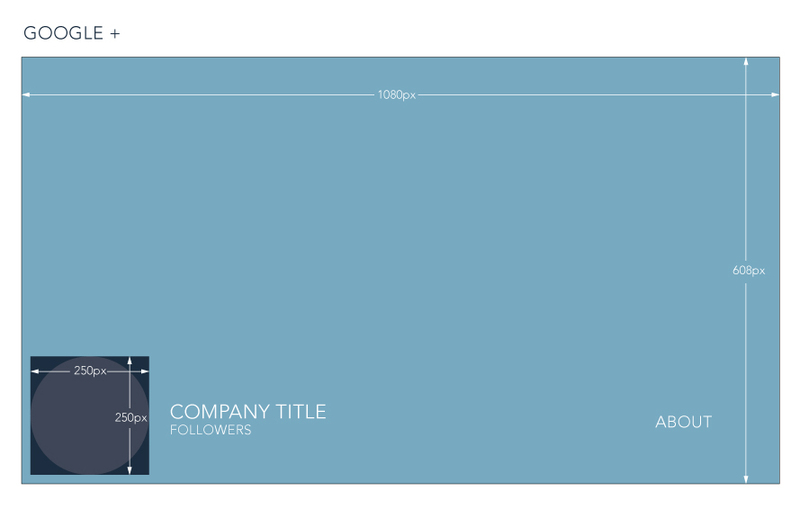 Your Twitter Profile Photo dimensions should be at the recommended 400 x 400 pixels. Twitter recommends that a JPG or PNG with a maximum file size of 2MB be uploaded. Note, your profile photo will be cropped into a circle, so ensure that no part of your logo is cut off. The larger image located at the top of your brand’s Twitter account is called the header photo. Like Facebook, this large area should be used to complement your brand’s profile photo to highlight a key product. This photo has a large display of 1500 x 500 pixels. However, since Twitter has a responsive design applied to their site and app, the desktop and mobile versions will show the same way, and the header image will be scaled and cropped to be displayed on different screen resolutions. You’ll want to leave at least 70 pixels at the bottom and top of your header photo to ensure any visuals or text is not cut off. 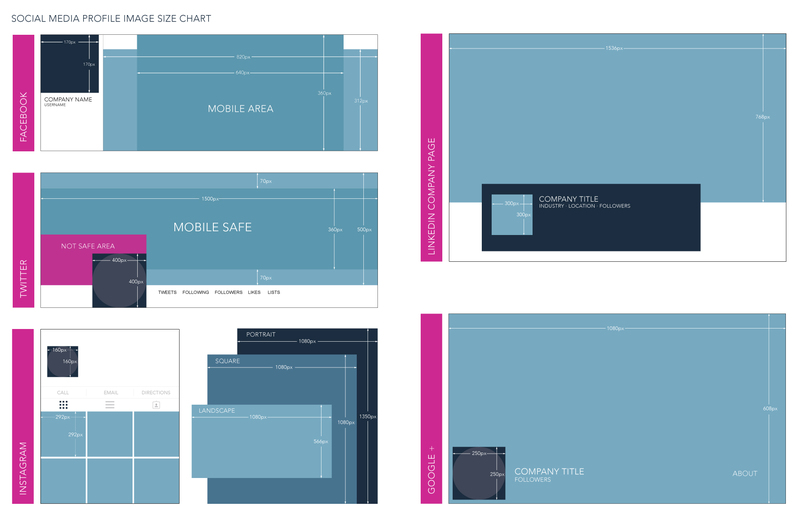 So technically, you should be designing within a 1500 x 360 pixel area to be safe. You’ll also need to leave ample space in the bottom left corner of your header photo to ensure any content or text doesn’t get cut off by your Twitter profile photo, which is overlaid on top of the header photo in the bottom left corner. For a tweet with a single image, the aspect ratio is 16:9. Twitter recommends posting a larger size, such as 1200 x 675 pixels, however the minimum is 440 x 220 pixels. This size will display well on mobile and desktop. When you tweet a link, this is the image that Twitter automatically pulls from the website (if the website has this setting enabled). The size of this image is 800 x 418 pixels. You should make sure that an image is automatically shown when your blog link is tweeted and that that image aligns with these specs so that no text or visuals are cut off. Google has created several products for both users and businesses to utilize. While Google+ may not be right for all brands, many people with niche interests, like photography, are still very active on their profiles. The dimensions shared are for a G+, Google+, or Google Plus brand profile. Google recommends you upload a photo that is at least 250 x 250 pixels. Google does not give a maximum upload size as they would prefer larger photos. Keep in mind that when you upload your square image into Google+, Google changes the image to become a circle shape—so the outer edges of the square will be cut off. Image types that can be uploaded are JPG, GIF, or PNG. Google+ created an even larger cover image space for their social media product. Google recommends that the image you upload for your cover image be 1080 x 608 pixels. The smallest image they will allow is 480 x 270 pixels, and the largest image you can upload for your cover photo is 2120 x 1192 pixels. When sharing an image on Google+, the recommended dimensions are 497 x 373 pixels, and the image types accepted are JPG, PNG, and GIF. Instagram first launched as an app only platform, but has enabled some features on desktop for brands to more easily manage their accounts. Most desktop versions of social media platforms seem to have different image dimensions. But on Instagram, there’s no option to upload from your desktop. All dimensions for Instagram are mentioned in mobile only because the platform has given limited abilities on the web. Photo thumbnails are also important for sizing in Instagram, since there is now both portrait and landscape sizes. Your Instagram Profile Photo is shaped into a circle, so keeping this in mind is important. This profile image should be 160 x 160 pixels with the understanding that the corners of the image will be rounded off. 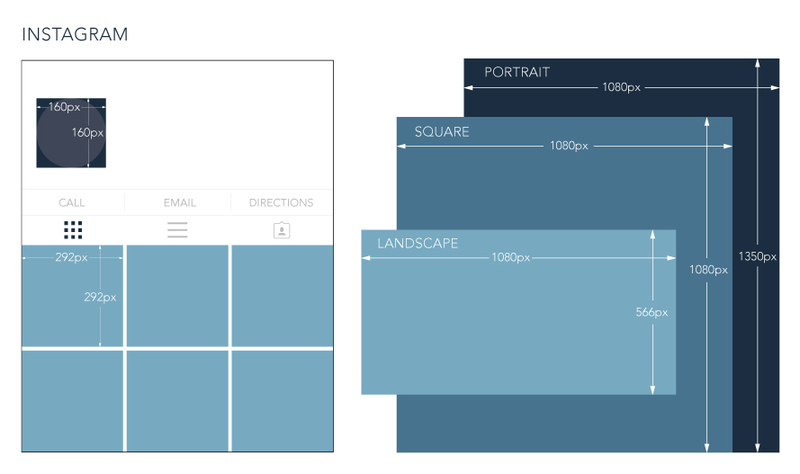 Square image sizes are recommended to be 1080 x 1080 pixels. The support for higher resolution images was rolled out in an update in 2015, to make sure photos look crisp and clear on all devices. You can have beautiful landscape and portrait shots to fit in your Instagram feed without forcing you to crop part of them as a square. By tapping on the small round grey icon or pinching with your fingers, you can switch the photo area to allow for a landscape or portrait sized photo with aspect ratios between 1.91:1 and 4:5. Note, the thumbnails of these photos will still display in a square dimension. Once a photo has been uploaded to Instagram, the photo will then live on your profile. When someone visits your profile, they’ll see thumbnails of your photos that you’ve previously posted. These thumbnails appear on the page as 292 x 292 pixels. LinkedIn is not necessarily the best social media tool for every business (this platform is typically a good fit for B2B companies), but for those that it makes sense for, having the most professional looking company page is what will set you apart from the competition. The background image you upload to your brand’s company page on LinkedIn requires a different approach than you would use on Facebook or Twitter. On LinkedIn, you want to keep your brand’s personality, but also need to remember that this is a professional setting. It’s recommended that business highlights or strong company branding is used in this space. 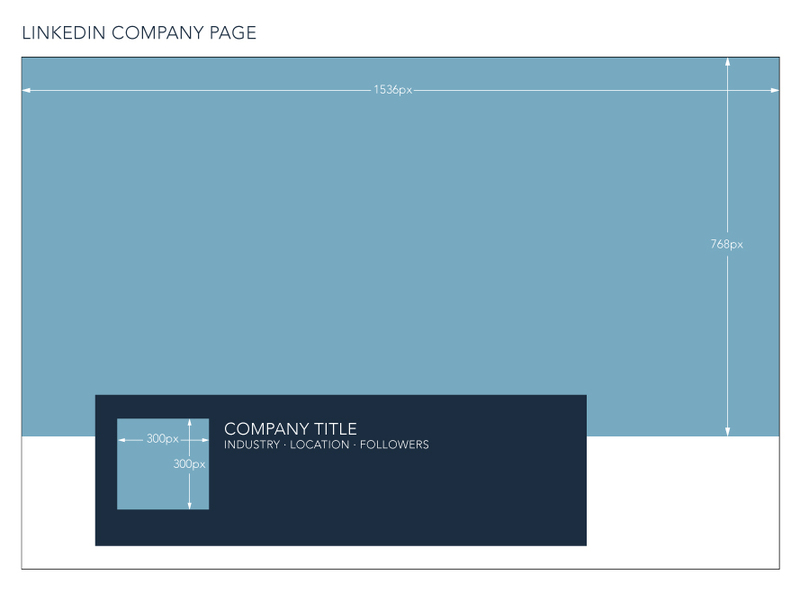 The background image on your LinkedIn Company Page should be a landscape layout and 1536 x 768 pixels. LinkedIn also recommends that you upload a PNG, JPG, or GIF file at a maximum of 2MB. As of the most recent LinkedIn update in January of 2017, the banner image is cut off at the bottom by a white box that houses the company name and logo, so you’ll want to be aware of that when designing your banner image. It’s also important to note that LinkedIn will adjust your background image according to the screen it’s displayed on, so your image may be trimmed horizontally or vertically. To be safe, avoid images with lots of text and be sure to use a high-quality image. When uploading your company logo, you must have a PNG, JPG, or GIF file. LinkedIn recommends a file size of 300 x 300 pixels. This logo is in a square format. When posting an update to your company page, you may want to add an image. This image should be 1200 x 627 pixels, and use a 1.91:1 ratio. If you use an image that is less than 200 pixels wide, the image will appear as a thumbnail to the left of the update, instead of the larger format. There are other features on LinkedIn that come and go (and sometimes come back again), and the details and image specs change seemingly daily. If you’re going to be using Showcase Pages, Career Pages, LinkedIn advertising, etc., we recommend checking LinkedIn Help to get the most up-to-date specs for the image type you’re looking for. LinkedIn even typically adds the last date the specs were updated at the bottom of the page, for your reference.